There are plenty of ways to make cars grab your attention. Spinner wheels, lime-green paint jobs and racing stripes come to mind. But few cars turn heads as tastefully as this one, the gorgeously styled Audi A7. Not only is it one of the most beautiful four-door cars you can buy today — with a coupe-like roofline that tapers to a stunning, crisp edge in back — but it’s also a monument to contemporary design. It’s very fresh, very new, yet completely devoid of any “car of the future” spaceship weirdness. Does it look futuristic? In a way, yes, because it offers a peek at the design cues other cars will be stealing in three years. Audi is the top trendsetter in the car fashion world, which means it’s also the most frequent victim of design-studio larceny. The Audi A7 is one of the most stylish four-door cars on the road today, with a back end that looks more like a two-door coupe. Even in the uber-trendy niche of German four-door coupes, its styling seems to stay one tiny step more modern than its counterparts from Mercedes, Porsche and BMW. 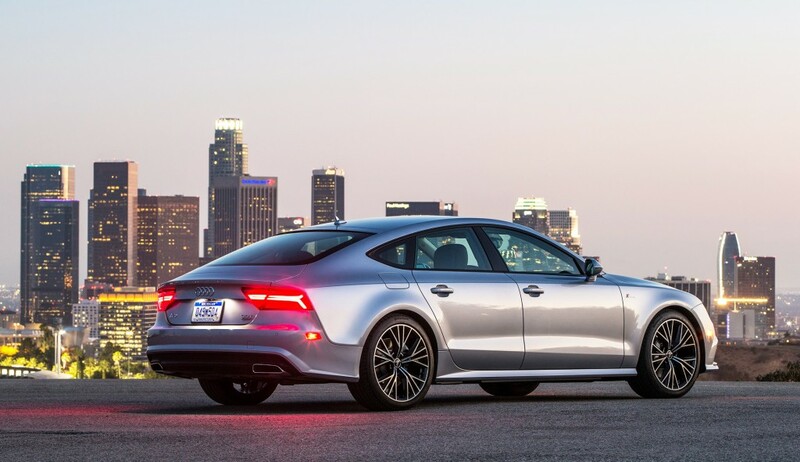 To stay ahead of the curve, Audi tweaked the A7’s look in both front and back for 2016. LED headlights are now standard on all A7 models, so the front fascia and bumpers were redesigned to more tightly fit around the smaller, high-tech lamps. And on its signature back end, the A7 gets LED taillights and trapezoidal tailpipes. Of course, to get people to spend at least $68,300 for your car — that’s the starting price — you’ve got to deliver more than pretty looks. Audi shoves ample “wow” factor into three areas that justify that price: cabin quality, technology and muscle. The A7 has one of the most well-built, sumptuously cool interiors on the market, almost evocative of the trendy W hotel chain. It comes across as luxurious but not stuffy, a delicate balancing act. It packs a technological punch, too, with a features list that reads more like that of a smartphone or high-end gaming computer. Audi’s press release boasts of putting “4G LTE wireless and NVIDIA quad-core high resolution graphics technology” in the new generation of its digital interface. It responds so quickly and looks so eye-poppingly brilliant that it’s no surprise there are lots of nerdy bits doing hard work behind the dash. And then there’s the power. Audi’s new-generation digital interface has impressive graphics and a fast response time, no doubt helped by its hardware from computer graphics company NVIDIA. As if last year’s engine wasn’t strong enough, Audi squeezed another 23 horses from its 3.0-liter turbocharged powerplant to bring its output to 333 hp in 2016. It generates musclecar-like acceleration with a very un-musclecar-like smoothness as it reaches peak power at 5,300 RPM. If you want more torque and ridiculously good gas mileage, you can opt for the TDI diesel A7 for $70,400. And if you’re a well-healed speed lover, you can get the 450-horse S7 for $82,900 or the over-the-top, 560-horsepower RS 7 for $106,500. It’s a gorgeously styled luxury car that looks like a coupe but has the added practicality of four doors. It’s a premium car in every sense, from power to technology and cabin design.